It has come to my attention that some of the Commander's Guides are very, very old. Like, two and a half years old, and written when all we had were Wave 1 upgrades to play around with. That's... ineffective in this day and age from the perspective of a new player. What good are you going to get out of me telling you that "Officers for the VSD start with Admiral Chiraneau..."
So, while we wait for Wave 7 to be officially released, let's update some of the Wave 1 (and maybe Wave 2!) Commander's Guides, starting today with the VSD. The VSD - of all ships in Armada - has changed and benefited the most from new upgrades, which is important as the roles in which it previously shined have been taken over slowly but steadily by more specialized ships. At the moment, there are a vary limited number of things that it does very well at, and two major weaknesses of the platform that you need to work around. Each one is slow - the slowest speed in the game with no tricks to increase it. Where all other Speed 2 maximum ships have Support Teams and thus access to Engine Techs, the Victory only has Speed 2. In addition, its speed chart is just bad, with only 1 yaw at it's furthest click at both speeds 1 and 2. The Commander upgrade Moff Jerjerrod can make that significantly better, letting you use all 4 yaw at speed 2 with a navigate command, but he still doesn't increase the maximum speed. Because of this, the ship needs good deployment and/or good objective selection to define where the fight will take place. Every other part of the ship shows it's age as a precursor to the Imperial Class Star Destroyer. 3 Command / 4 Engineering values puts it on par with the Imperial Class, while 3 Squadron with Weapon Teams / Offensive Retrofit leaves it a decent, but not spectacular squadron pusher. For defense, it has a decent 3 shield on the front and sides, and just 1 to the rear. 8 Hull makes it more robust than comparable Rebel ships, but only slightly. A Brace and two Redirects give it more survivability, but without a natural source of defensive retrofits for Electronic Countermeasures, it remains weak to any ship that can generate Accuracy results at a reasonable rate. For guns, they are comparatively speaking the cheapest ways you can get specific dice onto the board. The Victory I-Class has the one of the best natural damage arc in the game, averaging 5.25 damage per roll. Only the Imperial Class Star Destroyers and MC80 Liberty-Class Cruisers can compete with that naturally, equaling the damage in the case of the MC80, and exceeding only in the case of the ISDs, all for considerably more cost. The drawback being that it is a forward arc only, and requires close range that it's slow speed makes difficult to achieve. The Victory II-Class on the other hand has not only a very good medium range gun (again, only outclassed or equaled by Rebel Large base ships, and only beaten on the Imperial side by the ISD II-Class), but with the Offensive Retrofit and Disposable Capacitors it has become the single best Long Range platform in the game, if only for a single turn. Being able to toss 3 Red and 3 Blue dice at long range for just 88 points, or at two targets for 95 (just add Gunnery Team) means that it can cover a lot of distance with its guns. Let's talk Commanders. These days, the VSD might as well come with Moff Jerjerrod stapled to it, or at least hanging out on another ship nearby. Though he is not needed, but he more than doubles the ship's natural maneuverability, taking away one of the biggest weaknesses and turning it into a tight turning sniper (Victory II-Class) or a big mobile wall (Victory I-Class). Other good commanders are Motti (2 extra hull on an already very hull-efficient ship), Darth Vader (Red dice rerolls on a ship likely engaging at long range, with extra redirect tokens to spend). To a certain extent, the VSD is the preferred ship of someone running Admiral Konstantine, due if only to it's good price point comparable to the Interdictor or Imperial Class Star Destroyer, though Konstantine remains a very niche commander. On the other hand of the spectrum, Ozzel does next to nothing for the VSD, unless you want to use him to go from Speed 2 to 0 and back again. Leave the VSD home if you're running him. For officers, the VSD doesn't really have much in the way of standouts. For named officers, Minister Tua helps give the VSD a defensive retrofit, which it otherwise would not have access to. A near necessity if the VSD is going to go toe to toe with anything on a Large base. Captain Needa allows the VSD to improve its long range capabilities, either on defense or to take a Turbolaser Reroute Circuit. Several named officers such as Aresko, Grint, Hondo, or Yularen help with tokens, and the VSD being Command 3 and a high impact activation can make use of all the tokens it can get. Captain Brunson makes the slow speed of the VSD into an asset, allowing you to hug an asteroid or station and get better defense. Generic officers are not frequently seen with the VSD, but there are a few options to look at. Intel Officer can help make your long range attacks punch through evade tokens, or a full attack hurt more. 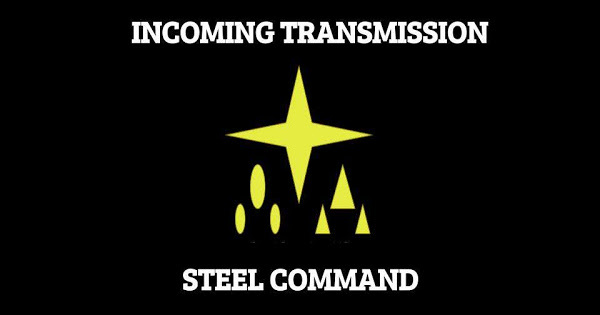 Skilled First Officer or Support Officer help keep your commands set, which is important for any slow Command 3 ship. Titles are not typically seen on a VSD these days, due to them either being high priced (Dominator / Warlord) or used for a role that the VSD is not seen much in anymore (Corrupter). Of the three, Warlord is probably the most commonly seen, as you can combine it with H9 Turbolasers to "spin up" a Red dice hit into a double, and make every anti-squadron shot with the ship an automatic hit (Critical > Accuracy > Hit). Still, that is 16 total points of upgrades on a ship that isn't fast or able to take a large volume of fire. There is a new title worth considering though, and that is 7th Fleet Star Destroyer, which lets a cheap VSD help protect a more expensive ISD. Weapons Teams / Offensive Retrofits are usually one of three options. The VSD II is pretty much guaranteed to have Gunnery Team on-board, to supplement Disposable Capacitors. This allows the ship to use its 6 dice front arc on two ships at a long range approach. The VSD I is pretty much going to ignore offensive retrofits and take Ordnance Experts, to ensure that if they do get into close range, their hit really, really hurts. The other option for the VSD I is to make it a more expensive but slightly sturdier / harder hitting Quasar, and go with Expanded Hangers / Flight Controllers. The two Turbolaser upgrades to look at for the VSD are Quad Battery Turrets and Dual Turbolaser Turrets, both at 5 points. Quad Batteries are for you going at Speed 1 to be able to add another die to your attacks for anything that almost certainly will be going faster than you. Dual Turbolasers let you add a Red and remove a die. Both are worth about .75 damage for 5 points, with Quad Batteries being slightly better if you can get them to trigger. The VSD I wants either External Racks or Ordnance Pods. Both are cheap, and the VSD I isn't going to be putting its black dice to work very often. External Racks give it a chance to do some considerable damage if their black dice do go off, and even contribute well if the enemy tries to sneak around the side of the ship. Ordnance Pods let your VSD contribute to the fight as a flak boat - in this case consider attaching Kallus as an officer and using the Warlord / H9 combination, to flip a Red die added by Kallus into a Double Hit if it lands on anything other than a blank (75% chance or 1.5 damage added per attack). The VSD II has several options for Ion Cannons, depending on what options you have for your Blue Dice. With 3 natural blues, you have a decent chance of a critical on any given roll, and that number gets to a near statistical certainty if you have rerolls (or an actual certainty with Screed as your commander). Option 1 is just to say "screw it, I want guaranteed damage". SW7 Ion Cannons are your answer. Adding .25 damage per blue die means you are already adding .75 damage for 5 points, or 1 damage if you are using Quad Battery Turrets. No rerolls necessary. Option #2 is to go for critical results, and Wave 7 gives us Heavy Ion Emplacements. 3 bonus damage to shields if you can get a critical hit (don't forget these trigger before regular damage is dealt). Putting this onto a long range shooting VSD is going to be a lot of pain, and better than the old standby of Ion Cannon Batteries. Option #3 is for enemies that like to exhaust things, and you like getting criticals. This is a niche option, but if you want to stop things like Strategic Adviser, Electronic Countermeasures, Engine Techs, or Adar Tallon, then MS-1 Ion Cannons are just 2 points of insurance. No extra damage, but a lot more control of the board state. Let's look at a few ways that we can build out a VSD, and what role it can have in our fleet. This VSD is a supped up Quasar. Capable of some combat, but mostly being used to push squadrons ahead. Another option with it is to take Corrupter instead of Flight Controllers and use it to push TIE Bombers at Speed 5 or Firesprays at Speed 4 into an enemy ship. Like the Quasar, its strength is mostly its squadrons, but unlike the Quasar it can still toss some mean dice at things that get into close range of it, and it has 2 extra hull and 3 extra shields. This is 85 points of flank protection for an ISD. 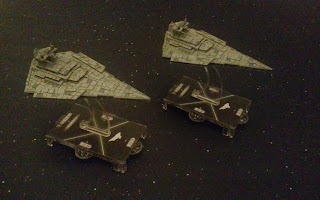 Not only is it able to reduce the incoming damage to the ISD with the 7th Fleet title, but anything fast enough to try and sneak past the front arc of the ISD is instead pulling right into the Victory, poised on the ISD's flank. Still 8 dice hitting your opponent. A relatively heavy hitter, though not quite as good as a VSDII for anti-ship at long range, this VSDI is able to dump anti-squadron fire on anything bold enough to get close. 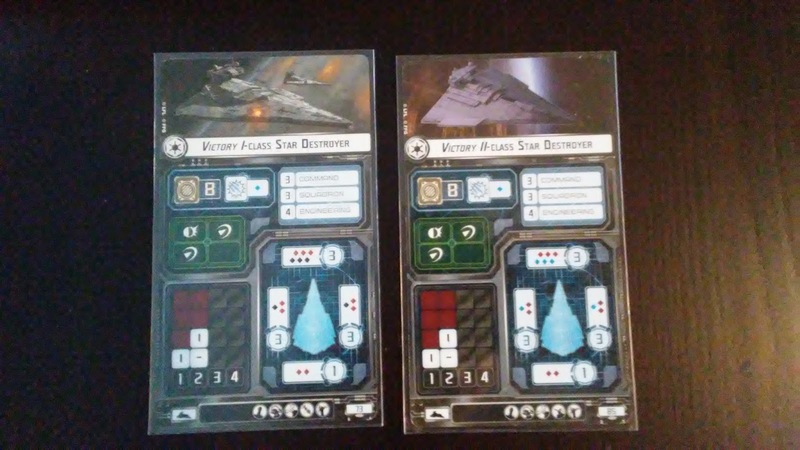 With potentially 2 anti-squadron attacks, Agent Kallus also adds even more damage against named squadrons by adding a Red die which can be "spun up" into a double through H9 / Warlord on anything but a blank roll. Plus, guaranteed damage from the initial Blue die from the same combination. Pouring on the hurt from down town. This ship hangs back and throws out 5.25 average damage at long range (assuming Quads are able to be used) or 6 damage with a Concentrate Fire. Add in a critical effect, and you're also adding 3 non-Braceable damage from the Heavy Ions, and with 4 chances to roll the critical (or 5 with a Concentrate Fire) and you've got a very, very good chance of doing 6 damage in an initial attack even after it is braced. A high ceiling and low floor, plus Intel Officer punishes your opponent for spending a defense token. Best used with Vader or Screed as your commander, but could work with anyone. Less of a burst, but more consistent. Understanding you won't always get 2 attacks, and Gunnery Team may be wasted points. 6.25 average damage from the front arc, which you can get to 7.25 with a Concentrate Fire - a good number as odd numbers are where post-brace damage jumps up. Best used with Moff Jerjerrod, because you don't need rerolls! Thx for the advice, I have two VSDs and keep loosing every time I use them. Maybe these new builds can help me (although I have used the carrier build before). Someone pointed out on the FFG Forums that Leading Shots is an option for an Ion Cannon upgrade on a VSDII. Definitely is, especially if you're not running a different dice modification upgrade like Vader or Screed. I think Leading Shots is better on low Blue Dice ships though, and you can get enough dice on a VSDII to make SW7s a better upgrade for both average damage and damage floor.